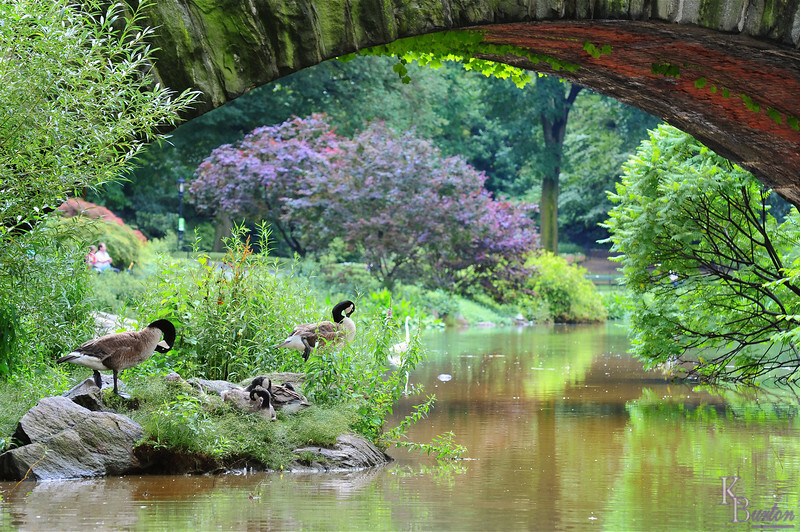 It feels like the stone bridge nestled in the south eastern corner of Central Park has been included in photographs captured by every man woman and child in America. Spring thru winter looking north from numerous vantage points makes for truly wonderful images. Today however, with the sun overhead and facing me there was nothing from that direction that would add to the spans legacy image wise, so I kept heading north for the heart of the park and hopefully more appealing opportunities. As I walked up the path that leads over the bridge I noticed what a rich golden brown color the mud filled shallows on this end of the pond looked with the sunlight glistening off it at this angle (a wonderful brown color that I failed to reproduce in processing no matter how hard I tried). Leaving the path and walking down the steep incline, I crept over the slick grass gingerly to keep from flying into the air and landing on my backside and startling the waterfowl enjoying the warm afternoon sun. Stopping at waters edge I gazed at the rock hewn arch from an angle I haven't seen photographed nearly as often. Unlike the other side of the bridge the sunlight shining on this side of it created a kaleidoscope of colors so striking in scope, that it absolutely deserved to be recorded by someone for posterity. I really like this one K-man! I wouldn't recognize this as a famous site. The stome texture of the bridge really makes the shot work.